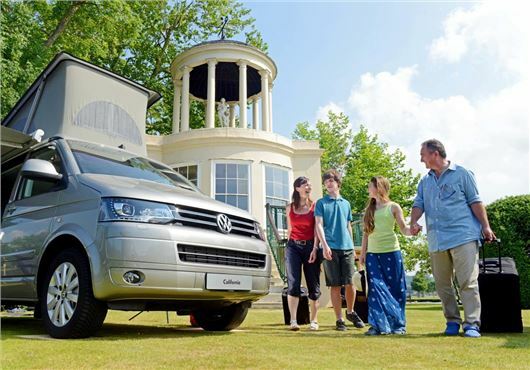 Volkswagen Commercial Vehicles has paired up with hotel website LateRooms.com to offer six Volkswagen California SE camper vans as ‘hotel rooms,’ initially on Temple Island in Henley-on-Thames. The VW Hotel California will eventually move to other picturesque locations across the UK. The California camper van ‘rooms’ are available to book from an affordable £35 per night. Each has room for four adults and features a pop-up roof, kitchen with a fridge, twin-burner cooker and a sink with running water. Other features include wood-trimmed cupboards, integrated window blinds, an awning and two chairs, plus WiFi and iPod docking. Temple Island is just downstream from Henley-on-Thames and includes an ornamental temple, or ‘folly’, built in 1771. It was originally designed as a fishing lodge. Inside there are wall paintings that are thought to be the earliest Etruscan style artworks in Britain. The island is the starting point for the Henley Royal Regatta.